Topaz, symbol of love and affection, aid to sweetness of disposition, and birthstone for November, is one of nature's most wonderful gemstones. Imperial Topaz is the king or queen of the topaz family and commands the highest price per carat over all other topaz. Topaz is a very hard gemstone with a Moh's hardness of 8 and is a very durable stone and an excellent choice for all types of jewelry. Imperial Topaz is rare and not commonly seen in jewelry stores. 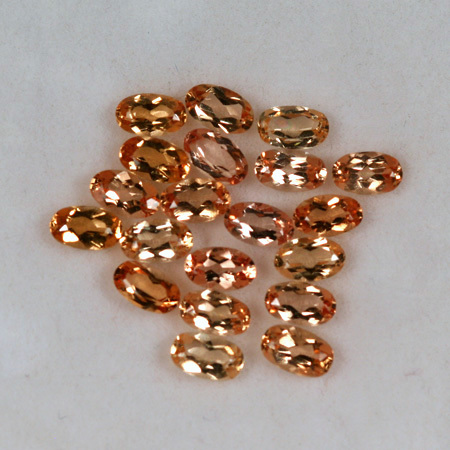 Imperial topaz color may be a yellowish orange, orangy yellow, yellow with overtones of slightly purplish red, red, orangy red, reddish orange, or pink. To be called Imperial topaz gems must have a secondary color in these ranges. Natural red topaz is very rare and commands the highest price per carat and may be called Red Imperial Topaz in the gem trade. Rare Pink Topaz also exist and are called Pink Imperial Topaz in the trade. The finest Imperial Topaz come from Ouro Preto-Brazil, The Urals of Russia, and recently fine imperial topaz have been found in Colorado-United States. The name "topaz" is thought to be derived from the Sanskrit word "tapas" meaning fire. If you are looking for a truly unique gemstone for your collection or to be worn in jewelry guarenteed to turn heads Imperial Topaz is an excellent choice. Weight: .28 carats average weight. Beautiful orangy yellow with pink overtones. Excellent cut and polish. VVS, eye clean clarity. There are 20 of these fine gemstones available. Price listed is per gemstone.